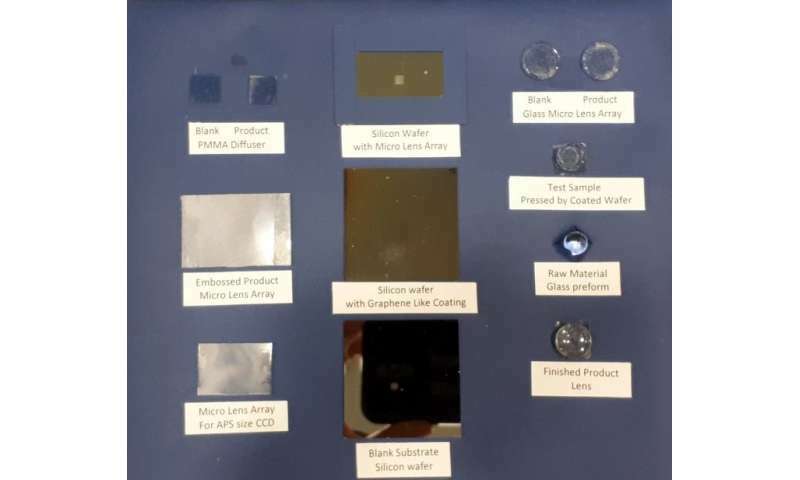 The Hong Kong Polytechnic University (PolyU) has developed a novel micro-embossing device for manufacturing precision glass lenses with high image quality. The lenses have the resolution required for state-of-the-art optical instruments and devices in varied fields including astronomy, national defence, medical scanning, and consumer products such as cameras and mobile phones. The invention can emboss ultra-precise optical microstructures in glass in an environmentally friendly way, saving electric power by 60 times and reducing manufacturing cost by two-thirds compared to conventional machines. Glass optical components are difficult to fabricate as they require a much higher molding temperature and extremely hard-to-machine carbide materials to make the mold. It is also difficult to emboss micro- and nanoscale optical elements with micron-sized glass microstructures. However, with surging demand for powerful lenses of small size and high resolution in advanced optical systems, there has been mounting need for optical glass to replace optical polymers, which have much lower transmittance. Taking a DVD high-definition optical pickup lens as an example, the feature size is as tiny as 0.9 micron. Conventional lithography methods used for mass production result in high product costs, yet the lens produced has much lower precision than those obtained from molding or embossing. Today, China has the highest output of optical lenses in the world. Yet, due to technological limitations for producing high-end lenses, its total market value is still lower than Europe and Japan. 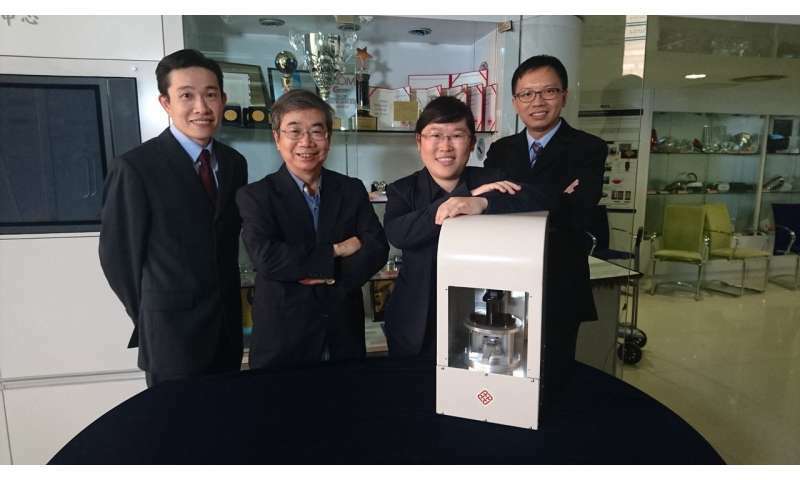 The research team led by Professor LEE Wing Bun and Dr. LI Lihua from PolyU's Department of Industrial and Systems Engineering has adopted a novel molding design with graphene-like coating and self-developed heating technology to produce the micro-embossing equipment to produce micron-level microstructural optical components in glass. Compared to conventional bulky infrared heating devices with high energy consumption, the novel technology is more environmentally friendly and cost effective. The use of a graphene-like coating can heat up the optical glass precisely and quickly with low energy consumption, while reducing thermal expansion and deformation of the mold. The control and monitoring software can also provide instant online readings of the temperature to allow fine-tuning and adjustment of the process parameters, and thus shorten the cycle time. Such novel features enable saving electric power by up to 60 times, compared to conventional infrared machines, and cutting the manufacturing cost by two-thirds. Being an electrically conductive material with high wear characteristics, graphene also enables smooth stripping of the glass workpiece from the mold after the embossing process. Furthermore, micron-scale pattern can be replicated on the glass substrate. The novel embossing equipment has wide applications in opto-electronic products, including cell phone micro-lenses, camera lenses, DVD pickup lenses, micro shuttle lenses, f-theta lenses for laser printers, projection television magnifiers, optical communication V Gutter substrates, micro-lens arrays (MLAs), and Fresnel lenses for collecting and tracking solar energy. In light field optics, the new applications of great potential include 3-D camera heads, three-dimensional robotic vision systems, as well as lenses for long-range shooting, detection of low-altitude drones and security monitoring.